This is a list of the National Register of Historic Places listings in Polk County, Florida. This is intended to be a complete list of the properties and districts on the National Register of Historic Places in Polk County, Florida, United States. The locations of National Register properties and districts for which the latitude and longitude coordinates are included below, may be seen in a map. There are 71 properties and districts listed on the National Register in the county, including 2 National Historic Landmarks. Lakeland Contains the largest single-site collection of Frank Lloyd Wright architecture. (#01001337) Roughly Avenue A, NW., Pope Avenue, NW., and 6th and 7th Sts., NW. (#01000306) 115 East Street, N.
(#00000660) Roughly Lake Martha, 2nd Street, NE., 5th Street, NE., and Avenue A, NE. 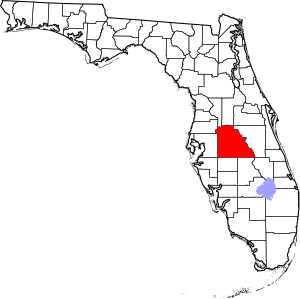 National Register of Historic Places listings in Polk County, Florida Facts for Kids. Kiddle Encyclopedia.